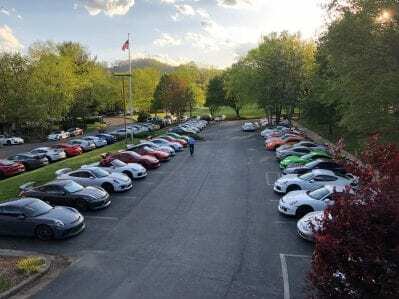 HIAWASSEE, Ga. – Disadvantaged children will have a reason to smile this holiday season, thanks to the generousity of Smokies GT, a non-profit club of Porsche owners that raises funds for worthy charities. The organization hosts a local event each spring to benefit the Cystic Fibrosis Foundation, and graciously extended $5000 of their good-will to the Shop with a Hero program. Hiawassee Police Department heads the annual initiative, pairing first responders with area children to travel and purchase Christmas gifts, while providing a positive mentoring experience. Hiawassee Police Chief Paul Smith expressed deep gratitude for the donation from Smokies GT, as well as to others who have contributed to the cause, for the added ability to bring deserved cheer to underpriviledged children. A founder of Smokies GT provided background information on the charitable club. “We have an annual event in Hiawassee along with smaller events throughout the year. The focus is on enjoying these great cars in ways for which they were built, on the track, and on mountain roads. At the spring event, we enhance our passion of driving by also raising funds for charitable causes. One of our members has two children with Cystic Fibrosis- so a great deal of focus is for us to raise money for the Cystic Fibrosis Foundation,” the spokesperson, who asked to remain anonymous, relayed, “Hiawassee has always been so welcoming to our group so we would love to find more ways to give back to the community. “The Smokies group was started “by accident” by a few Porsche GT3 owners who simply wanted to go for a mountain drive. The drive got bigger and bigger, turned into a weekend and we are now in our sixth year,” the representative continued, “The group has grown to over 400 GT owners from all over the US and some from Canada. There will be over 100 Porsche GT’s at this year’s event in Hiawassee, coming from as far as Seattle. For additional information on Smokies GT, visit their website.